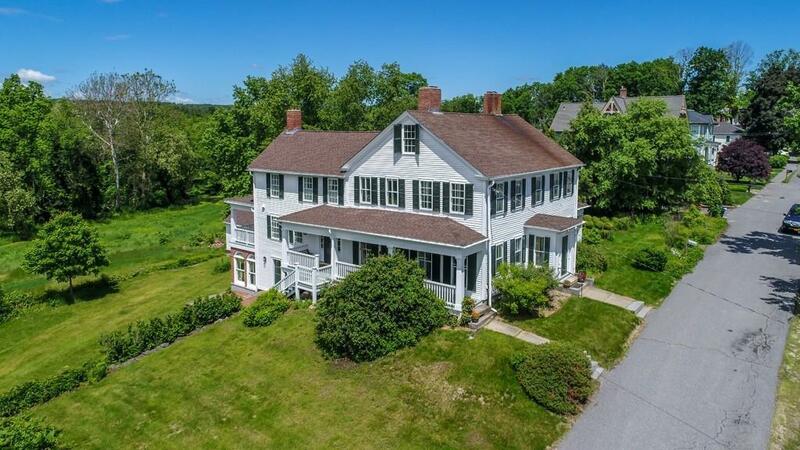 Meticulously restored, the elegant and spacious 1833 Elias Danforth House overlooks the Nashua River intervale, steps from Lancaster's historic town green. This Federal style home features 4 floors,14 light filled rooms, front/back staircases, 3 porches and a heated 3 story carriage house/garage/workshop. Period details are carefully preserved; modern comforts unobtrusively added-no expense spared. Large kitchen w/custom Kennebec cabinets,oak island,slate counters,Viking/Subzero appliances. Butler's pantry w/wet bar. Great flow for entertaining-amazing sunset views! Central air, 9 restored working fireplaces,floor to ceiling windows w/original glass,period hardware and lighting, wood floors through out. Commodious renovated period baths. Glorious sunroom w/radiant heated bluestone tile floor. Basement summer kitchen,stone walled laundry. Wine/root cellar. Tiered gardens,woods and field. Town water/sewer. Quality and scope of restoration is unsurpassed-truly an exceptional antique home. Listing courtesy of Christina Sargent of Foster-Healey Real Estate. Listing provided courtesy of Christina Sargent of Foster-Healey Real Estate.